By popular demand Swarm has made it possible to purchase SWM tokens on the Swarm platform. These SWM tokens are needed to invest in the opportunities listed on the platform. Getting those tokens used to be a bit cumbersome. Not anymore. Swarm has added a Bancor widget which allows you to purchase SWM tokens with any of the cryptocurrencies accepted by Bancor. The tokens will be deposited into your ERC20 wallet, after which you can deposit them into the Swarm platform. Sign into your account to check out the new Bancor feature. Swarm is now supporting DAI Stablecoin by MakerDao. This means you can now deposit DAI and use it to invest directly into the opportunities listed on the Swarm platform. The two newest investment opportunities, SPRK and PCX, both accept DAI. Explore the investment opportunities today. Recent DAI News: The Dai Stablecoin is a Game Changer for Ethereum and the Entire Cryptocurrency Ecosystem. To make crypto-investing as convenient as possible, Swarm has launched a mobile security token application for Android smartphones. With the app you’ll be able to manage your wallet, your portfolio and get a full transaction history, all on-the-go. Download the Android app and leave a review. Note: Work is underway to get the iOS version approved and launched. Tokens representing equity in individual private tech companies are coming to Swarm. While secondary access to private company equity is not new, tokenization is. The security tokens will give investors more flexibility and global access to opportunities, all via Swarm’s infrastructure. The first tokens offered will represent equity in Coinbase, Ripple, Robinhood, and DiDi. SparkLabs, a U.S.-Korean venture capital firm, has partnered with Swarm Fund to launch SPRK, a security token that allows you to buy into two of their accelerator programs. The fund covers a 6-month Internet-of-Things (IoT)-focused initiative in Songdo, a Korean smart city. It also covers an accelerator for agriculture and food tech in Australia, called Cultiv8. SparkLabs has already raised capital for both initiatives — $500K for the IoT program and $5.6 million for Cultiv8 — and it is aiming to bring in at least $6 million from the token. SPRK is now listed on the Swarm platform — view it here. FARMcoin has entered into a partnership with Swarm Fund to launch FARM, a security token that allows you to invest in infrastructure to help unbanked subsistence farmers in Africa. The goal is to provide financial opportunities for the almost 700 million farmers across Africa, who either cannot get a loan or are forced to take one via moneylenders at uneconomic rates. FarmCoin is a joint venture between GMEX Group’s subsidiary FinComEco and Block Commodities. It is focused on financial inclusivity and social responsibility and has already engaged with more than 20 countries across Africa. Check out this and the other investment opportunities on the Swarm website. 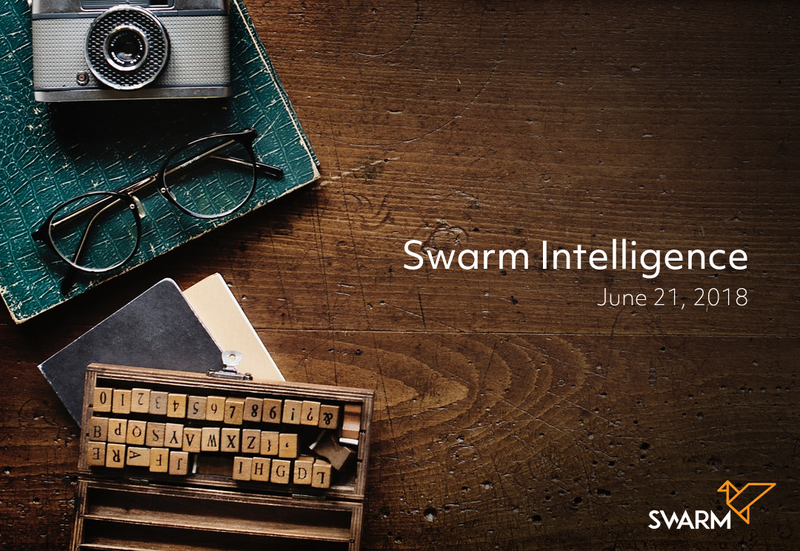 If you’re interested in learning more about Property Coin Fund (PCX) — one of the several live opportunities listed on the Swarm platform — you are invited to watch Swarm’s June 19 ‘Meet the Funds’ webinar. In this online event PCX fund managers Andrew Jewett and Matt Miles shared their goals and strategies for the fund, and answered live questions from the community. Catch the Webinar Replay on our Facebook Live page today. We want to make it easy for you to decide if Swarm is the place for you. We’ve created a page where all Swarm investment opportunities are publicly viewable right from the homepage. We encourage full transparency and power to the people — in the end, that’s what Swarm is about. If you are interested in Swarm Fund and would like to meet with its leadership, there’s no better way than to see them in action at events close by. For those who live in the US or Asia, we have the following opportunities available. If you plan on traveling to any of these events, make it a point to look us up. San Francisco (USA), 16–19 June — Swarm Fund CEO Philipp Pieper takes part in a panel discussion at the Blockchain Economic Forum. Los Angeles (USA), 19 June — Swarm Fund CEO Philipp Pieper delivers a keynote presentation at the City Blockchain Summit. New York (USA), 20–21 June — Swarm Fund CEO Philipp Pieper participates in a panel discussion at the 15th Annual Non-Traded REIT & Retail Alternative Investment event. Seoul (South Korea), 21 June — Swarm Fund’s Chief Investment Officer Timo Lehes will be present at the SparkLabs DemoDay. Singapore, 21–23 June — Swarm Fund’s Chief Operating Officer Chris Eberle will take part in a panel discussion at CoinAgenda Asia. Chris and Swarm’s Account Manager Vivian Jane are looking forward to meeting you on the exhibitor floor. In Swarm’s first Community Call, its CEO Philipp Pieper and COO Chris Eberle took the mic to answer user questions that had come in via Telegram. Listen to the replay and get their insights regarding how the organization is doing, how the growth has taken them by surprise, and what they expect for the future. Listen to the replay of Swarm Community Call, follow Swarm on SoundCloud and most importantly, engage with us. We want to hear from you. If you want to be the first to know what Swarm is up to and what’s top of mind in the Swarm community, the Swarm Telegram channel is the place to be. Here’s where you’ll find product previews, live updates from the core team, healthy debate, and a healthy dose of humor. The Telegram channel will also give you access to admin support — 24 hours per day, 7 days per week. Join the Swarm Telegram today. You may be following Swarm on Facebook, Twitter or Telegram, but have you seen us on YouTube? Swarm is constantly adding new video content — informative, relevant and always up-to date. The Swarm YouTube channel is the place where you’ll find the helpful ‘how to’ videos, and where you can see Swarm’s leadership in action — on stage and at a more a personal level. Subscribe today and see us in action!